The TCA62735AFLG is a charge pump type DC DC Converter specially designed for constant current driving of white LED.IC can outputs LED current 120mA or more to 2.8-4.2V input.IC observes the power-supply voltage and the output voltage, and does an automatic change to the best of step up mode 1, 1.5 or 2 times. It is possible to prolong the battery longevity to its maximum.This IC is especially for driving back light white LEDs in LCD of PDA, Cellular Phone, or Handy Terminal Equipment. 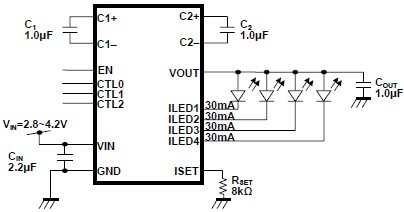 This electronic project t LED driver is very simple and require few external electronic parts. Due of simplicity of this circuit this project not require additional explanations . If you want to change this design , please consult the manufactured datasheet .Some features of the TCA62735AFLG electronic project are Switching Frequency : 1MHz(Typ. ), Output Drive Current Capability : Greater than 120mA , 4 Channels Built in Constant Sink Current Drivers, Sink Current Adjustment by External Resistance, Soft Start Function , Integrated protection circuit TSD (Thermal Shut Down) .